Complying strictly with international foods standards. We have the highest compliance and quality food safety standards. We are always striving to minimise operational risk related to food supply by complying strictly with international food standards, and our integrated management system has been certified globally according to ISO 9001:2008 and ISO 14001:2004. In addition, Seven Seas is the only ship supplier with the ISO 22000: 2005 certifications in all of its main hubs, demonstrating our ability to control food safety hazards in order to ensure that the food is safe at the time of human consumption. This includes a full product traceability and recall system in place. Providing state-of-the-art storage equipment and enforcing the highest level of freshness. 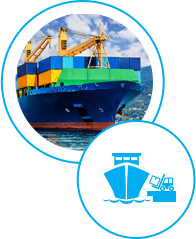 Providing state-of-the-art storage equipment such as the DNV-approved offshore containers, reefers, dry, PRS and thermos isolated containers to maintain freshness throughout the supply cycle. Adopting Hazard Analysis Critical Control Point programme (HACCP) in all main hubs. commitment to the HACCP program ensures strict control of food safety, freshness and quality. HACCP is a comprehensive program that ensures the risks and hazards associated with food safety, freshness and quality are systematically evaluated and appropriately controlled along the entire supply chain from the product source to delivery to the end customer. Receipt of goods from supplier. When products are received at the warehouse, they undergo a strict inspection procedure. Potential hazards are identified and dealt with by fully trained staff. Regular audits are also conducted on Seven Seas' suppliers. We source high-quality products globally in bulk, allowing us to pass the cost savings to our customers. Consistent, transparent and quality service. Our core selection of 400 most common food ingredients allows for a simpler ordering process, saving time and boosting efficiency. Together with Electronic Data Interchange (EDI), customers can reduce back office overheads significantly by cutting down manual processing, errors and data disputes. Our transparent and competitive tender process fosters long-term business partnerships with carefully-selected vendors while ensuring that customers receive the best total cost of ownership solution. Temperature controls are stringently implemented throughout Seven Seas' facilities to ensure maintenance of the cold chain at all points. Potential hazards are identified, prevented, and issues resolved by trained staff on a daily basis. Picking and dispatch of products. Temperature control is verified. Only the appropriate handling practices are followed. Products are dispatched only when they pass the strict conformance criteria. Wide range of fresh, quality provisions including bonded stores. Customers can get access to an extensive range of high-quality products including fresh and frozen meat and seafood, fresh fruit and vegetables, dairy products, canned foods, soft drinks, cakes and biscuits. There is also a broad range of Indian, Philippine, Greek, Spanish and Oriental food staples to meet the preferences of the international crew. We also built up a core selection of bonded stores from selected suppliers and brands.